Paperclay is a composite material formed by a mixture of clay, water and cellulose fibers coming from paper. 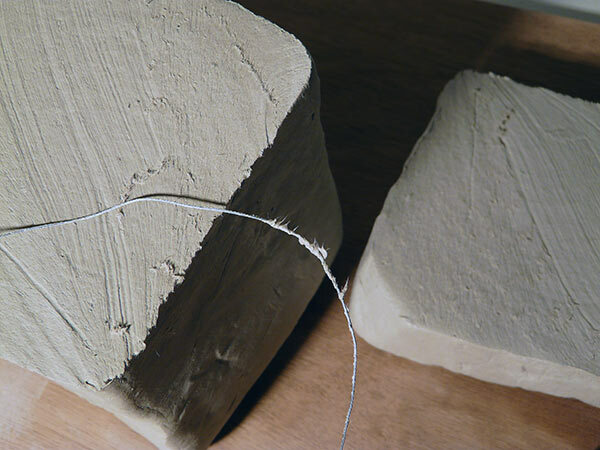 Paperclay is a fiberclay processed with cellulose fibers coming from paper. 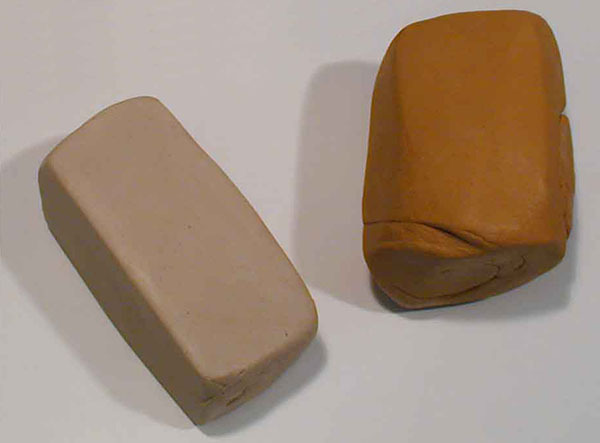 The clay body can be made by earthenware, stoneware or porcelain. Clay can be found in nature formed by fine particles torn from rocks by erosion. The moving of these particles throughout space and time gives to the clay its specific colours and properties. The clay used for modelling is freed from impurities and contains the right quantity of water to make it malleable while preserving its shape. All types of clay are suitable for paperclay. Paper is mainly composed of cellulose fibers coming from plants. 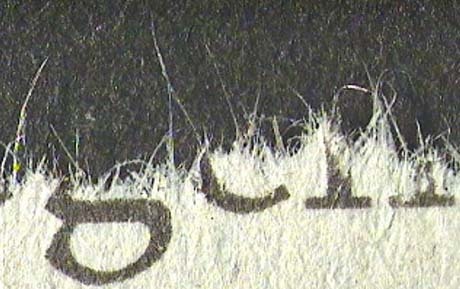 The cross section of these fibers is about 0,03 mm for a length between 1 to 3 mm for the most common papers. The fibers needs to be detached from each other before they are added to the clay by soaking the paper in a large volume of water. The amount of time and energy required depends on the type of paper used. Fibers improve qualities of common clay, the modelling mass and the greenware become stronger and can be worked much more thinly, in drape and transparency. You can join different elements at all moisture levels : wet on wet - wet on dry - dry on dry. High or large sculptural pieces can be supported by various materials and paperclay gradually added after hardening. Paperclay becomes strong after drying so you can handle it easily. Paperclay is a modelling, filling and covering material. It can be used as it is, combined with any kind of materials for mixed media or enforced by a framework. The elements of different materials included in the mass and dispersed on the surface are hold in place when drying by shrinkage. Pieces created with paperclay are lightweight, transportable and recyclable. Once dry, paperclay is very compact, strong and steady. It can be painted, varnished or patinated. Paperclay can be used for sculptural ceramics. 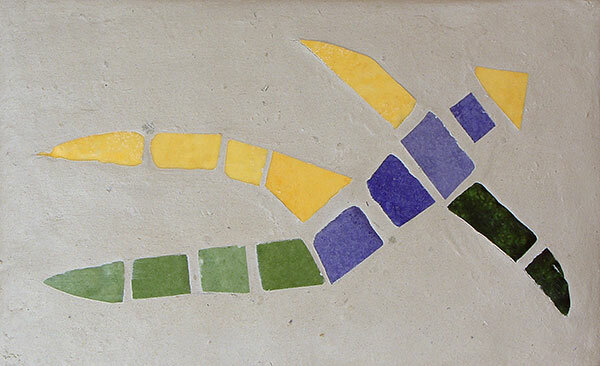 Large, thin and high pieces can be created, as well as more traditional works. Because technical constraints are reduced, paperclay allows more freedom and develops creativity. All type of clay firing can be applied, especially one-firing glazing and raku. The fibers burn at the beginning of firing and leave a microporous structure that absorbs thermal shocks. 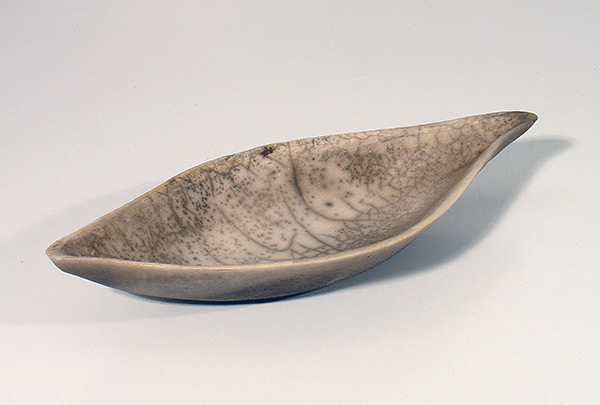 All type of clay firing can be applied, especially one-firing glazing and raku. The fibers burn out at the beginning of firing and leave a microporous structure that absorbs thermal shocks. 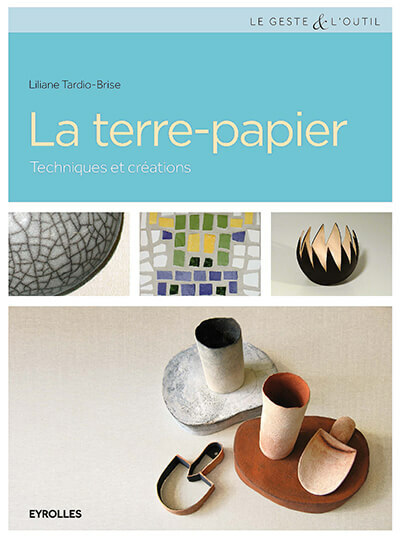 The french paperclay book « La terre-papier - Techniques et créations » written by Liliane Tardio-Brise, is essential to discover and learn more about this composite material. The author analyses the clay, the paper and the cellulose fibers. It also highlights the particularities of the mixture. Learning how to prepare your own paperclay allows you to adapt the amount of fibers to your need and to recycle dried clays or waste paper. Intended for both amateur and advanced ceramists, aimed to open new paths to creation far beyond the world of ceramics, this 168-page book presents conventional and unexpected applications illustrated step by step. The book displays the work of international contemporary ceramists and a rich bibliography. Ceramic suppliers sell paperclay in a ready-to-use form. How to make your own paperclay ? Disperse 1 kilo of dry clay in 1 liter of water to obtain a homogenous clay slip. Dip half a roll of toilet paper in a bucket full of water. Mix until it breaks down and becomes homogenous. Add the sieved fibers to the clay slip and mix the paper slip. Pour the paper slip on a plaster surface and let it stiffen. Wedge the paperclay to a modelling clay.